What is digital 3D sculpting and what are some software’s I can do it with? Digital 3D sculpting is a more intuitive form of 3D model creation that suits artists coming from a traditional sculpting background. If you have ever played with clay it is not dissimilar. It is useful for creating organic form concepts and 3D objects for artistic reference. Some software allows you to paint onto the created model as well. Generally models made using this method have a very high polygon count the more detailed the model is and have to be retopologized or lowered in resolution and optimised for texturing for use in game engines (I have virtually no experience of this process yet but I’m learning), but it is generally useful for artists and illustrators as is. In any case before getting into retopology you have to create your model somehow. I’ve put some links to better explanations about retopology for you at the end of this article if you are curious. 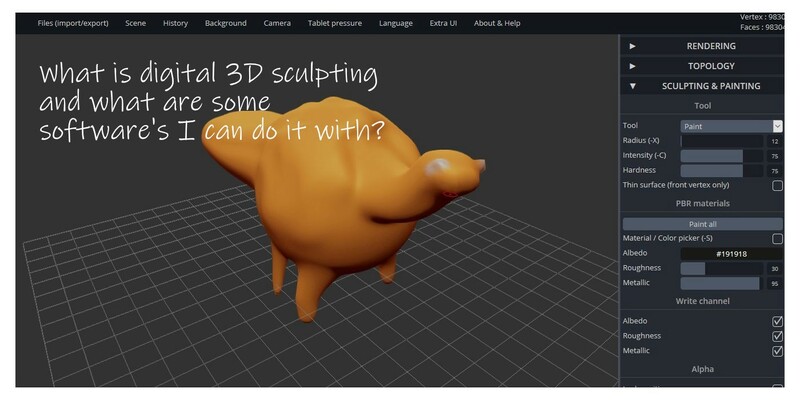 Here are some free and commercial software options for digital 3D sculpting. The different software all have their own features, pros and cons, but I’m not really going to go into detail in that regard as I haven’t used all of them. The ones I’ve tried so far are Blender, Sculptris, SculptFab, Sculpt GL, Dilay and 3D Coat. Disclaimer: I’m not being asked or paid to write this article and you should investigate the listed software’s individual websites to see the full features then evaluate which ones would be most suitable for your experience level, use and budget. Blender is a powerhouse of a program for 3D modelling and it also supports 3D sculpting. There is a high learning curve to using Blender for beginners to 3D modelling as I have experienced myself, but if you have the patience to learn it you will get hooked. I’m only just getting to the 3D sculpting, but it is fairly straight forward and there are some good online tutorials around. Pixologic :: Sculptris: Enter a world of digital art without barriers. Sculptris is a free 3D sculpting application which is developed by Pixilogic who also make Zbrush. It is a good introduction to 3D sculpting although no longer actively developed. There are now several other free alternatives to Sculptis which arguably have newer features. Rocket 3F does a bit of everything, but it also has 3D sculpting features. It is designed to be easy to use for artists and designers who want to create concept art. You can find out more about it on their website. Meshmixer is a bit like a 3D pocket knife tool. It can be used to kit-bash 3D objects together and it also has basic 3D sculpting features. It might be useful for creating base meshes for use in other more dedicated 3D sculpting programs. This software is designed to be intuitive for artists. The creator of this software has made some amazing models with it and the next version of it will have sculpting features and improvements, so it may be one to keep an eye on. This is in free open Beta at the moment but is being developed into a commercial software. It is designed to be intuitive and easy to use for 2d artists who want to use 3D and are already familiar with software such as Photoshop. One to keep an eye on again. This is very easy to use and if you are completely new to the concept of digital sculpting this will get you up to speed right away. You can use it in your browser without any need to install software on your computer. SculptFab is developed by the same people that do SketchFab and looks like an improved version of Sculpt GL. It has dynamic topology features. Rather like Sculptris but this is being actively developed. I tried it a few years ago and thought it was easy to use, so it’s worth a look. I think it would be good for creating quick base meshes. It has had many improvements since then from reading the change log. This looks like a free version of 3D Coat. It does sculpting, UV mapping and texturing. There is a pro version as well if you donate $2 to the creators email. I’m sure the program is well worth a try, it looks very good and it’s being actively developed. I’ve heard a lot of good things about ZBrush from other artists and Illustrators and I did buy the student/ amateur version of 3D Coat several years ago which was within my budget. It can also be used for texturing and has retopology features so I may look into it again soon now that I have a better 3D workflow knowledge after learning Blender basics from CG Cookie, YouTube and Udemy courses. There is a high learning curve to the more powerful commercial software to beginners to 3D modelling and sculpting. Some basic knowledge of 3D programs would probably help you. Lots of online training is available nowadays so don’t be intimidated if you really want to do it. If you have the budget the following software’s are definitely worth looking into for professional use although Blender is turning into a great alternative for professional workflows, especially the upcoming 2.8 version. This is the luxury option for digital sculpting. I used to just go to the website and drool over the art examples, but it was and still is out of my budget. They have professional licenses and educational licenses available. There is also a much more affordable stripped down version called ZBrush Core. 3D Coat has 3D sculpting and PBR texture painting features. It is very powerful. Mudbox has sculpting, painting, retopology and dynamic tessellation. If you are a student you can get it free for 3 years. It has a strange name, but Silo is 3D sculpting software. It has has had a recent update. The technical jargon puts me off a little from a beginners perspective though, but I’m sure it is all good stuff. Thanks for reading this article and I hope you found it useful. If you have any thoughts on this subject or know of any other options for 3D sculpting please feel free to add them in the comment section. If you would like to share this article with someone else who may like to read it please feel free to do so.